The Death of Catholicism | "I believe in Christianity the way I believe the sun has risen: not just because I see it, but because by it I see everything else." But we got past that, and now he’s walking all over, banging his big ol’ head on everything in sight, and filling our hearts with joy with his toothy smile and insatiable affinity for kisses. I think the understanding I’ve recently been graced with regarding what it means that we are adopted sons and daughters of God has shaped my heart more than just about anything else I can think of. As I look at my children and see how I, sinful and sorrowful though I am, burst with love for them and delight in every bit of their growth and cry when they’ve had health challenges, I cannot help but wonder at the love God must have for each of us. I feel privileged to be a parent, truly. To think that He might feel the same when He looks at me is incomprehensibly humbling and uplifting. The danger of writing a bunch of posts about the Seven Deadly Sins is that people will start throwing around the term “Catholic guilt” a lot. I get it. I’ve made the joke myself. It’s an easy cliche to laugh about. And I don’t even disagree that being Catholic comes with guilt. We have some pretty clear teachings about what sin is and what actions constitute a sin. But how many souls have been lost when no one told them about the hope beyond the guilt? How many people felt sick with sin and did not know about their Divine Physician? Or, more likely, how many stayed away from the Doctor’s office altogether, figuring it wasn’t that big of a deal, or I’ll just figure it out myself, or he’s just going to lecture me on health stuff, or he’s going to think I’m gross or weird or ugly? I think the idea of God as Divine Physician is a beautiful one, a hopeful one, because I know I need healing, I know I can get healthier and stronger and I know that God wants to lead me into that. But I also think there’s a reason Jesus didn’t lead with the vision of God the Doctor. He first had us know about the Father. Yes, good fathers discipline. They tell you if you’ve done something wrong. But they do so because they want you to grow, to learn to stand up straight, to open up your life to the infinite possibilities it can contain, to strengthen you to fight for the goods around you in a world that wants to hide them from you. Pope Francis tells us that the father in the Parable of the Prodigal Son must have been waiting on the terrace of his home every day, looking out for his son, hoping that he might one day return. How else would he have known he was coming and run out to meet him? This is our Father. This is the Catholic faith. Guilt? Maybe sometimes. Love? Always, unceasing, inconceivably patient and hopeful and steadfast. So are there sins that can kill the life of our souls? Yes. Does everyone struggle with them at some point or to some degree? Yes, me especially. He shows us our wounds so He can heal them. He wants to save our lives. Or, better still, he is our Father who allows us to get hurt so that we learn what we really want, but He is always there to hold us close as we cry, is always ready to give us guidance if we ask, and is always ready to forgive the sin because He sees who we really are and who we might someday be. And so even talking about sin is a hopeful thing for Catholics. Because sin never has the last word. There is always hope when we trust in our Father. Let me explain. When I was a child I often had toothache, and I knew that if I went to my mother she would give me something which would deaden the pain for that night and let me get to sleep. But I did not go to my mother—at least, not till the pain became very bad. And the reason I did not go was this. I did not doubt she would give me the aspirin; but I knew she would also do something else. I knew she would take me to the dentist next morning. I could not get what I wanted out of her without getting something more, which I did not want. I wanted immediate relief from pain: but I could not get it without having my teeth set permanently right. And I knew those dentists: I knew they started fiddling about with all sorts of other teeth which had not yet begun to ache. They would not let sleeping dogs lie, if you gave them an inch they took an ell. As I finally bring this series of posts to a close, a series six months in the making, interrupted by work and kids and classes and sins, I am reminded of this quote from Lewis. It absolutely describes why I came into my faith. I was ashamed, very ashamed, of many of my sins. In particular, I was ashamed of my wrath, lust, and pride. I saved these three for last in this series because they are the ones I am most embarrassed by, the ones I most hate to admit, the ones I wish would go away but which never do. It was the last thing I wanted to hear. I was too ashamed to even call my sins by their proper name. But luckily, or providentially, I was with a priest who knew that, as the Catechism says, “Like a physician who probes the wound before treating it, God, by his Word and by his Spirit, casts a living light on sin”, a priest who was willing to be the hands of God and expose my brokenness so God could heal it. The internet is not the appropriate place to share deepest-darkest, so I won’t, but I will say this: though some of my former ways of acting these sins out may be gone from or less of a part of my life, I know the spiritual cancer is still there. I know that in my pride I rebel against those closest to me when I feel like they haven’t noticed me the way they should, and I know I still can slip into a world of lustful fantasy in which I am surrounded by people who do notice me and praise me (we can lust and fantasize emotionally, not just sexually), and I can then soak in the resentment that comes from the fact that my reality does not match the universe I create in my head (because it can’t), and I can think of all the nasty barbs and pithy insults and self-pitying whines I could fling at these people around me, especially my wife, and I can exalt in the fact that I don’t say them because I am Such A Good Man. I know those sins still live in me. I know what I just wrote above is a sad and scary portrayal of a soul still sick with deadly sins. And I know they will kill me if I don’t let them die first, if I don’t stop feeding them, if I don’t let the One Who Conquered Death kill the deadliness inside me. This, though, is the hope of our faith. The grace of the sacraments is the water and light that wash the filth of sin, the medicine that kills the virus of selfishness that runs through my blood. Prayer is the therapy that strengthens the atrophied muscles and sets the broken bones in my heart, reflection the vitamins that reinforce my spiritual immune system, the conscience. And this is the path to perfection. This is how God the dentist, God the physician, is remaking me, is taking the pain of my sin and turning each moment of suffering into a flagstone on my path to His Sacred Heart. This is why the Deadly Sins can kill us, and why they never have to. This is how the One Who Rose can raise us anew whenever we are ready. This life of virtue, this spiritually healthy life where my souls cancer stays in remission, is the life I am ready for, the life I have already tasted, and the one I now must have in full. Thanks for your patience between posts. I don’t think anyone’s hurting without hearing from me, but I appreciate you humoring me and reading what little I can write when I can write it. The post I was planning to write was “The Death of Greed”, the first of the final four Deadly Sins I will address, and the first of the four I struggle most with. I don’t tend towards greed in the sense desiring to accumulate a lot of material goods for their own sake, the most commonly acknowledged form of this spiritual disease; rather, I sometimes get greedy about achievements. Stuff doesn’t do it for me. I’ve never had a lot of money or things. When I got married, my wife had already bought and furnished our house, and she laughed when I pulled up in my ’04 Chevy Cavalier two-door with a tub of clothes, a desk drawer of random crap, and my “box of memories”, the notes and pictures of things that had sentimental value, my only additions to our new home. But I am tempted at times to want to accomplish things, in part because I like challenges, which is good, but also in part because I want to prove to myself and others my value as a person and as a man. And there are things I have done that I am proud of, rightly, but that at times I look to as proof of my goodness and strength. The problem with this is the same as the problem with accumulating material goods: at the end of my life, they will amount to nothing. Perhaps I will have made some lives better. Perhaps I will be remembered by my kids and (God-willing) grandkids, but fifty years after I’m gone there will be little left of those memories, and then, eventually, nothing. Nothing in this life matters, in one sense, because it all ends. It’s all transitory. My greed will gain me nothing. But if what Jesus said was true, if He is Who He said He is, then everything I do has eternal weight; what C.S. Lewis calls “the weight of glory”. I believe this life matters because it is a choice about who we want to be for eternity and with whom we wish to spend it: ourselves, or God Himself. As I write this, my heart is heavy with the sense of loss of my Uncle Jim. He passed away early Sunday morning from a heart attack. This is actually my second Uncle Jim to die this year, one on my dad’s side, one on my mom’s. They could hardly be more different men. My dad’s brother Jim was unhealthy, mentally and physically, for much of my life. He had diabetes, was schizophrenic, and for the last years of his life was incapable of taking care of himself. My dad, with his other siblings and various nurses and caretakers, had that unenviable task, displaying a depth of love and sacrifice, even amidst frustration and sadness, that I have not seen anywhere else. In his sickness, Jim still had a deep faith and devotion to Mary. He would talk about this at times, though his infirmity and paranoia separated him, from what I could tell, from the life of the Church and the Sacraments. He did, over the course of his life, partake in at least five of the Deadly Sins, if his stories are to be trusted. I learned a lot as a young adolescent listening to that man; perhaps some things I wish I could forget. Still, it was clear that, as he always said, “Faith, family, and friends” were what he valued most, and I will always remember the kindness he showed me and the fierce loyalty he had to our family, as well as his love of good food and jokes and company. His health deteriorated over many years until his passing last December. My mom’s brother-in-law, on the other hand, was a doctor, a man who enjoyed walks and runs with their dogs, a man who flossed in the living room after Thanksgiving dinner, a man who had a love of travel and outdoor adventures that I heard about frequently from my brother who was blessed to go on many trips with him, my Aunt Kathy, and my cousins Zach and Tyler. I don’t know anything about his faith, to be honest. I’m not sure if he was Catholic or practiced a religion of any sort and am under the impression that he didn’t. I don’t know if he prayed or had any devotions. But he was so good to people. He was funny and quirky and kind. He was often quiet but always interesting, cool stories and humble intelligence and dirty jokes interweaving themselves in the conversations we would share, catching me off guard and making me laugh and wonder just who the heck this man was. As my sister said, “I tried to think of a bad memory with him in it. I couldn’t.” He was just a good man, perhaps a great man to those who knew him better, and though I was never particularly close to him (although, honestly, what the hell does that mean? He was family! He was a part of most of my life and so many important moments for me! So screw it, yeah, we were close, even if we didn’t have heart-to-hearts or call each other to chat! ), I have cried several times just thinking about the hole that will be in the circle of prayer before our holiday meals that “Uncle Heim” always filled. He died, stunningly, incomprehensibly, in the middle of the night from a heart attack, the healthiest guy I knew gone, just like that. It is still hard to even believe it happened. And so I have my Catholic faith, which is perceived at times to separate people into categories, which at times is impetus for some to judge others, which some use as a rubric to decide who is in Heaven and who isn’t. And I have these two men, neither of whom would, as far as I can tell, hit a perfect score on those tests some Catholics run persons through. My life is filled with James’s. My grandfather on my dad’s side was Jim. I have a cousin named Jim. I had two uncles named Jim. I went to St. James the Greater grade school in St. Louis for nine years. It’s the parish my family still belongs to. Now I teach at St. James Academy and have for the last seven years. I realized a long time ago that there is something in my life Jesus wants me to know about James. What St. James (the Greater) the Apostle is perhaps most widely known for now, other than being a member of Jesus’ inner circle of friends, is the Camino de Santiago, a popular pilgrimage to the site tradition holds as his final resting place on the northwestern coast of Spain. It was the subject of the movie “The Way” with Emilio Estevez and Martin Sheen and is traveled by thousands of pilgrims, believers and non-believers alike, every year. People the world over know about it, and some, like the Archbishop Emeritus of Kansas City, James (another one!) Keleher gave a personal attestation to in a homily I heard recently, make it a life goal to travel it. 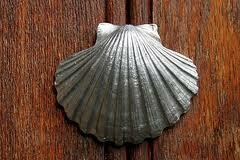 There are many fascinating things about the Camino, but the one that stands out to me most is the symbol you will find all along the way: the scallop shell. It has many meanings to different people, the most obvious of which for Christians is its connection to baptism as shells of this sort are often used to pour water over penitents as they enter the faith. And when I started this post, that was all I really knew about it. But as I looked into the Camino a bit more to make sure I didn’t make a fool of myself while writing this, I learned of a more widely accepted view: the grooves of the shell represent the many paths the pilgrims come by, all ending at the same destination. When I read about that meaning of the shell, my heart jumped. This was going to be the whole point of this post, even before I knew the full context of the scallop. What I have learned as I grow in my faith, as I’ve entered into a personal relationship with Jesus Christ through His Church, as I have been cured and filled by prayer and Scripture, as I have been reminded so beautifully by Pope Francis, is that the Church has never, ever, EVER been about anything but salvation. It’s not about “A supposed soundness of doctrine or discipline whereby…one analyzes and classifies others, and…one exhausts his or her energies in inspecting and verifying” (Evangelii Gaudium). It’s not about figuring out who is good or bad or holy or not. It’s not about any of that, though those of us brought up in the faith may be tempted to make it that because it makes us feel safe. It’s about being healed. It’s about being forgiven. It’s about being washed in mercy and love and being filled with life and life to the full. It’s about a relationship of complete and utter inequality between us and Our God, Jesus, Who loves us no matter what and is always, ALWAYS, inviting us into his arms, into his warmth, into that which we are all desperate for: eternal life. So I look at my uncles. Two different men. Two different paths. Two different lives. Two different deaths. But I have the same hope for them. It is hard for me to look at these two who, between them, showed me glimpses in our times together of each of the gifts of the Holy Spirit (my dad’s brother with fortitude, piety, and fear of the Lord, my mom’s brother-in-law with wisdom, understanding, counsel, and knowledge), men who I saw love their families and live with joy and make others’ lives better, men who made my life richer and more full of laughter, and think that they are anywhere but in Heaven, that they would have wanted anything other than the love of God when the moment of their final choice came, no matter what choices they did or did not make in this life. I don’t mean to say our choices don’t matter. I don’t mean to say they don’t impact our eternal destination. Just the opposite: I think all choices bring us closer to God or further, more ready to accept His love or less. But it’s not so cut and dried as some want to make it. We are all only saved by Jesus and through His Mystical Body, the Church, but how that happens in any individual case, I do not know. I cannot know. There are many grooves on the shell that run back to the one Source, many ways along the One Body of “the Way” back into His Sacred Heart. I know little of my uncles’ interior lives and the circumstances that surrounded them, but I know much of the mercy of Jesus and the pull of His Love that I feel every day in prayer and the sacraments and the love of men like my uncles and the hearts, now hurting, of my wonderful family, and they teach me of the love of God, make me believe ever more deeply and ever more fully that The Trinity, that exchange of eternal love and knowledge, has power enough to draw all of us back to Him through whatever ways He sees fit. And this is enough for me to believe that the Camino de Santiago has just begun for those two men, these two James’s. It is enough for me to believe that the same James that watched the Lord’s Agony in the Garden is interceding for my heartbroken family, even as he stands before God beside the men who bore his name to me. It is enough for me to hope, to rejoice in their deaths even when I’m sad, thinking that their earthly pilgrimage is over and that now they are being called “further up and further in” to the limitless love of God. To share with you this idea that struck me a few days after the US pulled a Mizzou against Portugal (and by the way, “pulling a Mizzou” is when you raise your fans hopes higher than they should rationally be and then pull the rug out from under them in the most heart-shattering way possible. To complete the Mizzou, the US would have to lose 15-0 to Germany so that their fans are not only heartbroken, but also embarrassed to be irreparably associated with the team. But back to the idea I had…). 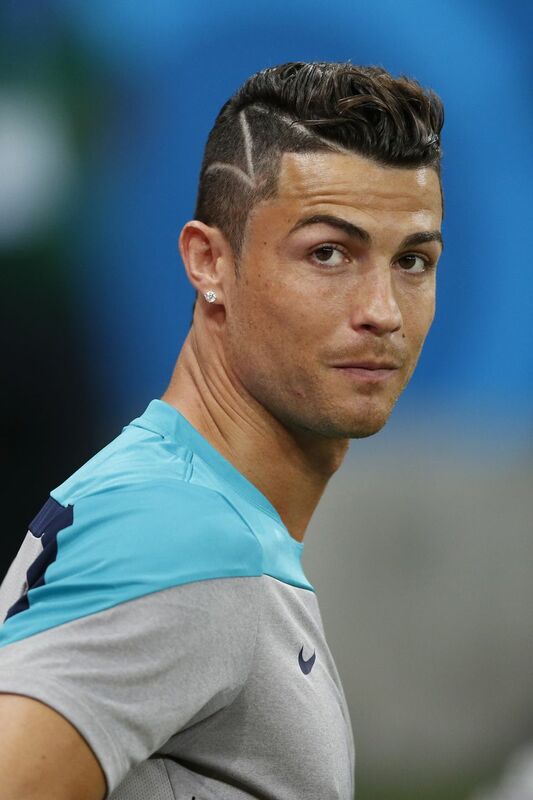 Christiano Ronaldo is like the devil. Just when you think he’s done bothering you or can’t hurt you anymore, that’s when he’s most likely to strike. Don’t let your guard down for a second. Geoff Cameron, are you listening? So as I mentioned in my last post, the sin of sloth is not one I often struggle with, except as a result of my gluttony (or the other two or three of my favorite Deadly Sins, which I’ll get to later). But whether you’re like me in that regard or whether sloth is the biggest challenge to your spiritual life, there’s always hope. And, as promised, we will look to this guy to find it. 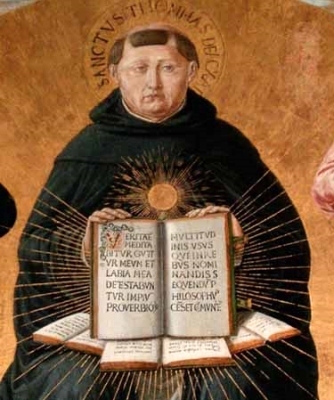 I was reading recently about some of the things St. Thomas Aquinas said about virtue, and I became painfully aware of just how much I have to learn from that man. I tried to find the source text for the idea I’m about to use (and, coincidentally, couldn’t), but instead found myself eyeballs deep in thoughts on “infused virtues”, ignoring my hungry children and angry wife so I could read more about the virtues I was failing at that very moment to practice. Anyway, and even though I couldn’t find this idea I read about in Aquinas’ own words (maybe one of you could direct me? ), I wanted to talk about it anyway. The idea was that when developing virtue, it’s not only necessary to have the self-control needed to do the virtuous acts, but it’s often just as necessary to stir up your emotions towards the act as well. Now, this caught my attention right away, because it seems to fly in the face of something I’ve always believed (and still do, as I will explain): we don’t need to apologize for how we feel. The one time my wife got mad at me, she didn’t have to be sorry for that. It’s just how she felt. When I feel sad, I don’t have to feel guilty; that’s just the way it is. Now, if in her anger my wife pulls a knife on me, an apology might be necessary. Or if I decide to just go to bed when I’m supposed to be watching the kids because I’m feeling down, there is some definite culpability at hand. But we don’t have to say sorry for how we feel. So when I read about Aquinas, I had to wonder, if we can “stir up” our feelings, does that mean we choose how we feel? To answer this question thoroughly would probably take a thousand page treatise on the effects of the Fall and the interplay of the different powers of the soul, and quite frankly I’m not the most qualified to do that. But I think it’s important to acknowledge that we can be inspired. What do we mean when we say we were inspired by a speaker or a song or a video? I think we mean that we feel differently than we did before, that even though we weren’t disposed to do something or care about something before, now we are. And I think Aquinas is telling us we don’t have to wait for our favorite motivational speaker to come to town. It’s possible to do this for ourselves. If I’m feeling particularly slothy (not a word) one day, I don’t have to apologize for my apathy; but I don’t need to be controlled by it either. The feeling doesn’t even need to stay for long if I don’t want to. I can think about the spiritual battle at hand and the consequences of failure. I can think about the man I want to be someday and the path necessary to get there. I can think about what Jesus did for me on the cross, or what my mom did for me growing up, or the moments of courageous commitment to prayer I’ve seen in others, and suddenly my spiritual apathy, my sloth, might start to dissipate. And so we find that our feelings don’t always have to come first. Most often for me, they should be last. If our soul can know, choose, and feel (intellect, will, and passions), then maybe I should think about the good and choose it before worrying about how I feel about it. While we can’t always control how we feel, we don’t need to let our feelings be in control. Again, returning to the idea of being addicted to our sins, alcoholics and other addicts talk about this phenomenon often: they don’t feel like walking away from their drug or getting themselves out of a tough situation or saying no for the thousandth time, but they remind themselves of the importance of their sobriety, stir up the courage to fight, and then after the moment has passed, good feelings sweep in and replace the angst and temptation and agony from before. This can work for our more easily-hidden addictions as well. And when we can’t, when this just won’t work for us, we go back to the engine that powers the 12 Steps: surrender. If we can’t seem to stir up the feelings on our own, we give up…and ask God to do it. That’s the Holy Spirit’s whole job, for goodness’ sake! To be Spirit is to be wind and breath, to be “breathed-into” (in-spiritus in the Latin); that’s Who the Holy Spirit is! And so, the alcoholics get it right again. The key is to ask God to take over, to admit that He is in control, because our feelings are out of control and in danger of taking control. That’s hard to do when you struggle with sloth because it’s sloth that makes us not want to pray in the first place, but the simplest prayer can be the most effective. The saints are full of phrases to be uttered in moments of temptation, so I won’t offer any here. But even quoting Carrie Underwood can work. Or if quoting a pop star seems out of place in your prayer, just tell Jesus you want Him to be in control. He won’t let you down.